My partner just her scan last week. 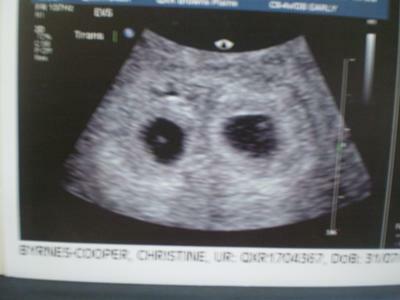 One fraternal twin 6weeks4days and the other 5weeks4days. Only one has a heartbeat,is this normal? 2 weeks time is the next scan but I can't wait and have been researching every website. Is there anybody out there with a similar story?? Thank you for posting this. I feel better seeing this. I went Thursday for my first ultrasound and they found 2 sacs as well. The first one measured 5w2d and the second measured 5w5d. It was too early to see the babies and heartbeats yet so I'm of course freaking out lol. I have another ultrasound this Wednesday and I'm praying to see the babies and heartbeats this time around. Good luck with your twins! I am 5 weeks today. I went on wed for sono and we saw two sacks- I am so nervous and excited- I have had two miscarraiges in the past and only pray that these two work out well. Thanks for posting teh picture, mine looked very similar, which is comforting. Hi! Thank-you for posting this picture! I went in on Nov 22 for an ultrasound they were thinking I'd be around 6 1/2 weeks and wanted to check because I had been spotting off and on for 2 weeks and they said I was actually 5 wk 5days along with twins! This looks exactly like my ultrasound! It is so reassuring. I go in on Dec 4th for my next one and I will be 7 wk 4days so I am hoping that they are both doing amazingly! I had mu US Tuesday the 13th and was 6 wks exactly. we could see two small sacks! Its not as clear as yours cause I apparently have a tilted uterus. Congrats to u! I had a sono today 7/14/10 & it showed 2 sacs....very shocked!! I go for a second sono on 8/11/10 to find out for sure. The doctor said he thinks it is twins but sometimes it takes up to 10 weeks for the sac to form totally together. We will see!! this is the stage I am at with mine, also in Australia. Can't wait to hear the heartbeats.